The easiest option is to install our plugin and login to your account. Plugins > Add new, search for Smartsupp Live Chat and click Install Now. Once plugin is installed, click Activate. 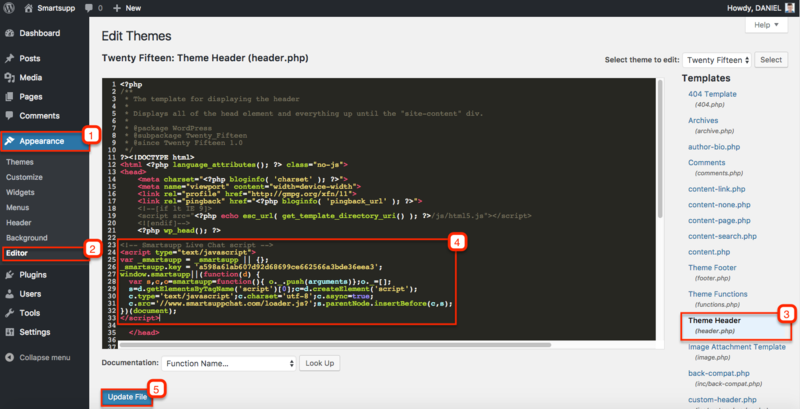 If you do not want to use plugin, you can insert code directly into WordPress theme. Be careful: you can destroy your site! Send this tutorial to your webmaster. Do not want to use plugin or you inserted code manually and need advanced custom changes? By default when you install our plugin or insert our code into header it gets displayed in all pages. In case you need to display our code on certain specific pages or maybe just one page only, install 3rd party WordPress plugin Scripts n Styles. You need to do a few small changes to our default code. Read carefully or it will not work. From our code remove these lines. … needs to look like you see below. EXAMPLE ONLY. DO NOT COPY! Go to Pages, edit page you want and below content in Scripts n Styles insert modified code. Click Update Scripts and Update your page.